Do you feel helpless many times during the week when your child or teen presents a problem you aren't ready for? Your child may be in a very irritable mood and you don't know what's cooking with friends, camp, or school. You're bewildered and don't know where to start to address this irritability. You are at a loss to know where to begin to manage the situation. Is your child or teen using sarcasm, slamming doors, barely speaking to you? If you have no idea what the behavior is about, how can you know what to do about it? Random punishing, yelling, even calm, firm instructions can fall on deaf ears and the behavior persists. Why? Because you don't know what you're actually trying to address. An approach that turns the clueless parent into a knowledgeable one is using Parental Intelligence that helps you find meaning in your child's behavior. Here are the 5 steps. Whatever the behavior, suspend your judgment, and just observe the sequences leading up to the behavior. Observe and consider what may be happening. Try on the idea there may be meaning behind the behavior. Let's say your teen is slamming doors for several days. You've had it and nothing's worked. So you stepped back, stopped yelling, and decide to trust your feelings, but first you need to know what they are. You notice when you hear the slam, you feel jolted, on edge, a sense of panic. Using those feelings, you begin to wonder if maybe those are feelings your teen is having, too. Suddenly you feel a lot less clueless about what your teen's experiencing even though you don't know why yet. This step often means some general conversations are in order with your child or teen. Just hanging out together and finding out what she's thinking about might help a great deal. You're looking to discover what her feelings, thoughts, intentions, and imaginings are. Chatting loosely, opening doors to talk about school and home lead to unexpected places. Without probing, you make comments like, "Hey what's going on lately? Wanna a snack in the den?" "Tell me more about that." Just see where it goes. Don't look for any solutions. Just listen. Your eleven-year-old is irritable for hours. You know her grades are good. She's anticipating summer fun. She just had a sleep-over with good friends. Then you consider her stage of development. Gee, her body is changing. Her skin is becoming sensitive. She's developing more interest in her appearance. You wonder when she might begin her menses. Her irritability comes more into focus as potentially a sign of bodily changes. By this point you know a lot more about your child, or teen. The behavior that made you feel so helpless now has a context. 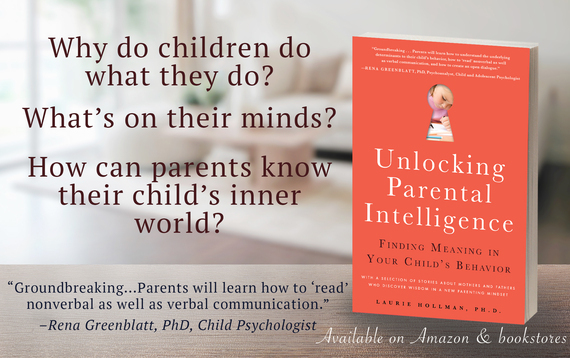 The behavior now has meaning given what you've learned about your child's or teen's thoughts, feelings, intentions, and stage of development. You know so much more about what your child needs and the stressors that are building inside their minds and from their environment. Let's say you discovered your irritable child is feeling uncomfortable with her changing body. You discuss openly and honestly the changes she can expect and offer to talk anytime she wants, respecting her privacy. Let's say you find out your daughter's been slamming doors because her hoped for boyfriend stopped answering her texts. You let her know how such disappointment hurts and the slamming doors ends because she feels understood and less alone.